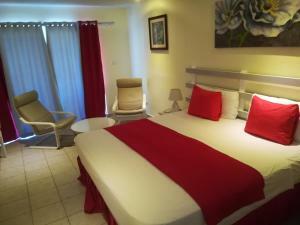 ﻿ Best Price on Aloan villa 3 et Aloan villa 4 in Las Terrenas + Reviews! Located in Las Terrenas, Aloan villa 3 et Aloan villa 4 offers accommodations with a terrace and free WiFi. The units provide views of the garden and come with a seating area, a washing machine, a fully equipped kitchen with an oven, and a private bathroom with free toiletries and a hair dryer. A microwave and toaster are also featured, as well as a coffee machine. The villa has an outdoor pool. A grill can be found at Aloan villa 3 et Aloan villa 4, along with a garden. Pueblo de los Pescadores is a 10-minute walk from the accommodation. Please note that payment must be done by PayPal. Please contact the property directly with the contact details provided in your confirmation. A damage deposit of USD 200 is required on arrival. This will be collected as a cash payment. You should be reimbursed on check-out. Your deposit will be refunded in full, in cash, subject to an inspection of the property. Please inform Aloan villa 3 et Aloan villa 4 of your expected arrival time in advance. You can use the Special Requests box when booking, or contact the property directly using the contact details in your confirmation. Payment before arrival by bank transfer is required. The property will contact you after you book to provide instructions. This property does not accommodate bachelor(ette) or similar parties.